I drove to Ron’s in Heeney, Colorado, arriving by 8:30. Ron drove us up the Spring Creek Road, north of Green Mountain Reservoir, to Blue Lake. The road would be passable with two-wheel drive but there are several rough spots so I was glad not to be in my low clearance car. The map I have of that area is pretty unreliable and we found the roads to be nothing like was illustrated on the map, however, we got there with no real problem and hit the trail just before 10:00. 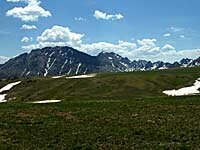 Elliott Ridge runs north/south at the north end of the Gore Range; Eagles Nest Wilderness. It’s a gradual ascent up the ridge heading south; quite easy considering the trail begins at about 11,000 feet. 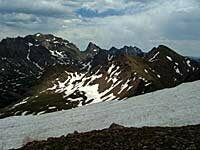 Views east and west from the ridge are expansive and shortly the view south of Eagles Nest and Mount Powell becomes quite spectacular. We saw a mountain goat trotting off out of site just after it saw us. There is a dip in the ridge two-thirds of the way to Meridian Peak which requires a descent of about 200 feet before climbing the last steepest part to the peak. Even there, this trail is not excessively steep. We were at the 12,390 foot summit of Meridian Peak by 2:00. Four hours seemed longer than I had expected but it’s about five miles and we had taken two lunch breaks, not being in any particular hurry. After shooting lots of photos and a panorama at the summit and picking out landmarks in the distance, we departed the top at 2:45. There was smoke in the distance from a fire near Gypsum and a resulting haze, making the distant views somewhat less appealing in the afternoon. Thick cloud cover made it kind of dark and cool for the walk back; quite welcome after several hours in the sun. We were back at Ron's truck by 5:30 and to Ron’s place by 6:30. Ron grilled a pork rib dinner that was quite tasty and I was home by 9:30.